A kitchen utensil that grinds whole peppercorns into fine, medium or coarse ground bits of pepper. 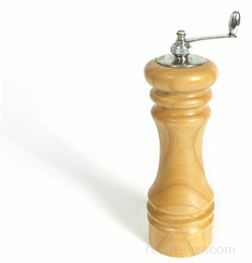 Pepper mills are available in a variety of sizes, styles and materials, such as wood, plastic or metal. Some mills have a handle on the top to turn when grinding while others simply use the round cap on the top as the turning device to do the grinding. On either the top or the bottom there is typically a tightening device that increases or decreases the tension resulting in a range of different grinds, but most often classified as small, medium or large grind. Peppercorns are placed in the mill, the top is turned and the ground pepper comes out the bottom. When using a pepper mill to grind pepper, a fine grind is best for salad dressings, purées, egg dishes, potato salads, and foods that do not want the pepper flakes to be noticeable. A medium grind is a general purpose grind to season meats, fish, shellfish, poultry, soups, stews, pasta, and miscellaneous savory foods. 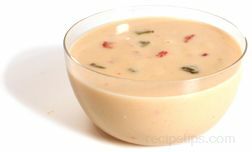 Coarse ground pepper is best suited for marinades, hearty meats, salads with thick or rich dressings such as Caesar salad, and any dishes in which the pepper flavor is to be noticed.